If You Lose Your Horse welcomes its very first live guest on the program this evening. Larry Wish is a prolific Minneapolis-based bizarro-pop artist. 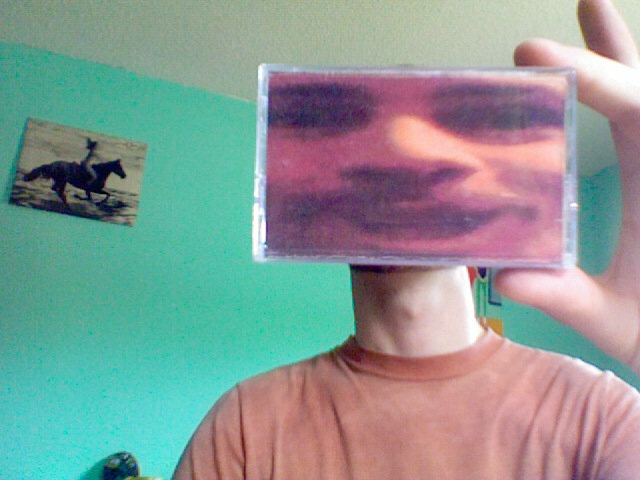 He's released material on venerable tape labels like Orange Milk, Truly Bald, and OSR. He swings by my parents' basement tonight to talk about his brilliant new tape, "Not From My Come From," which he recorded with his band Larry Wish & His Guys and released on Moon Glyph last week. @Scraps, @melinda, everyone, hello and welcome! Very special show tonight. @Ike, @DaveIV! Great to have you here. Please let me know if me and my guest go to far afield during our next break. We darn well might, @geezerette...glad you're here! children of Oingo Boingo, PF, Mothers OI, Moondog, & own secret sauce. Perfect for "rubber hose" animation,(b&w early style). Couldn't have said it better myself, @geezerette. Boing boing boing! That was really a lot of fun, @Larr and @Soup! @CoolSmell and @coelacanth! Now there's a dynamic duo. Thanks for swinging by. Hey, I just realized that 2017 is a prime number! Now, @Scraps, you'll have to remind me what a prime number is. It's been awhile since I took numerology. Very happy to have you aboard, @Alejandroool! Thank you so much, @LD! Always on honor to have the ears of a fellow Drummer on the show. Thanks for next time, Leaking Daddies!